There's more darts to ease you back in to reality, more arrows to soften the crash landing. Point your peepers towards the Lakeside, where the BDO World Championships have just got under way and will be covered extensively across the BBC. We'll be back for live coverage of the final next Sunday. Until then, don't work too hard. And then it was over. If Christmas means darts and darts means Christmas, then that really is your lot. The best of finals? Perhaps not, but it's been a tournament to remember. Shock exits for Michael van Gerwen and Phil Taylor, brilliance from Raymond van Barneveld and a nine-darter from Gary Anderson. Anderson is posing in front of the snappers on the stage. The Sid Waddell Trophy is going to Scotland for another year. Gary Anderson: "I am getting older and the body is starting to hurt. I'll keep plodding on and will give it another shot next year." Gary Anderson: "It never really happened for me. It was a scrape from the start with some good and some bad darts but I'll take it. "The way I've played and Aidy has played, it kind of killed the game." Runner-up Adrian Lewis: "Neither of us could get the graft of the match, we couldn't get on with it. "It was a strange old game. I thought I played well in the last three sets. "Fair play to him, he deserves the title. I think he's been the best player in the tournament. "I'm back up to number three in the world. I'll get back on the practice board and put the demons of this match behind me." Gary Anderson is ready to take the Sid Waddell Trophy and a cheque for £300,000. "And still champion of the wwooorrrllllldddd...."
As he gets his hands on the silverware, the crowd chant his name. 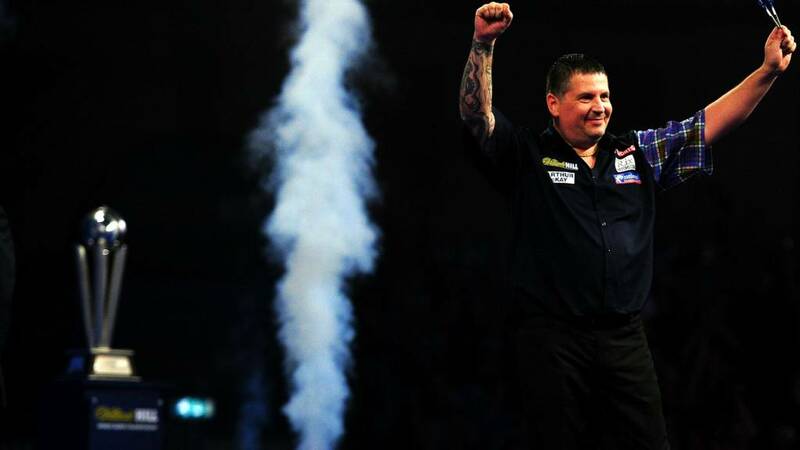 Gary Anderson is the champion of the world. Again. There's pyro, there's dry ice, there's a hug between the players. The highest quality final? Perhaps not, but it was compelling stuff. Won with double 12! Glory, glory Gary Anderson! The Scot wins a second successive world title in a match with more 180s than any other ever seen in the PDC. Anderson has his revenge on Lewis, his conqueror in the 2011 final. Anderson was pounded for four legs, but somehow found a break. This is loose, but both players are tense. Not too many signs of trebles. Anderson finally gets it right to leave 170 - the big daddy. Would you believe it? A 170 checkout for Gary Anderson! He's one leg away! What has happened to Adrian Lewis? He's just not missing. His average is north of 100, but it's still Anderson that is down to a finish first. He can't take 121, can Lewis take 140? Both make a bad fist of it, but Anderson is back on track with D8! He's back within two legs and has the throw! This is the big one. If Anderson holds three times, he's the champ. Lewis a 180, Anderson sets up 160. Lewis in again, another 180, even with a dropped dart. He's on 45 for a break. 13. Double 16? Yes! Lewis breaks! This match has come to life! Lewis has won four legs on the spin and is back in with a shout. Luke Almond: Don't understand people who think darts isn't a sport! Pure drama! Lewis is doing all he can here, making Anderson win it, rather than gifting it away. Lewis batters the 20 bed, which is starting to look like it has been chewed by a dog. The Stokie will come for 74 and the set. 14? Yes. 20? Yes. Tops? The set sealed in the blink of an eye. Anderson, though, is now playing about as well as he has in the match. A 650 maximum of the tournament. Lewis still has the better average, but is 23-16 down in legs. Anderson leaves 70, Lewis waits on 40. One at tops for the Scot? No. Lewis breaks. He's on course for the set. Lewis is such a huge man, he can almost lean from the oche and place the darts in. He responds to an Anderson maximum with one of his own, getting to 81 after nine darts. Double 12 for an 11-darter. What a way to respond to pressure. Lewis has the darts in the 11th set. He must hold, otherwise this final will be as good as over. What has Adrian Lewis got left? He must win all three of the remaining sets to win a third world title. Anderson was in this position last year. He led Phil Taylor 6-4 before being pegged back to 6-6. The Scot won the crown in the 13th and final set. Now we're seeing the best of these two men. Lewis a 180, but still not enough to get ahead of Anderson. The Scot down to a finish first, he'll have a look at 108 for the set. Lewis is back on 117. 17. Tops? A kiss on the lipstick! Gary Anderson leads 6-4 and is a set away from retaining his title. That doesn't hurt Anderson too much, he still has the advantage of a break. But, Lewis is improving. He needed only 42 darts to win that set. Lewis hasn't quickened his throw too. Anderson must take 86 as Lewis waits on 36 - sealed with D8. It's hotting up. They sing for Lewis as he looks to cling on to Anderson's tail. It might not be high quality, but it is dramatic. Anderson, by the way, has missed D10 11 times in this match. Lewis miles in front... 121? Tops? Yes! Lewis wins the set in the blink of an eye. Did that stop the rot for Lewis? He flows with a 177, followed by an Anderson maximum. Time to see the best of these two? Back-to-back 180s from the Scot, leaving 58. If he can't see, how good might he be with some glasses? Then again, three darts missed at D10, with Lewis in to punish. The Stokie to throw for the set. The Ally Pally commands you to stand up if you love the darts. Lewis is under pressure, any break of his throw could be terminal now. Anderson is to a finish first, 161, Lewis waits on 76. Anderson can't take it, so Lewis gets a look at tops. In she goes. Liam Forsyth: The school Christmas holidays clearly haven't done Gary Anderson any good! His maths are all over the place. Anderson gestures to the ref that he can't see. Really? You're playing very well for a man who can't see what's going on. He blows his cheeks as he leaves the stage and exchanges a glance with wife Rachel. He's two sets to the good, but looks concerned. What must Lewis make of it? He has to win four of the next five sets. Anderson, then, for a 5-3 lead. He's looking solid now, with some heavy scoring to go with his superior doubling. He's down to 86, with Lewis miles back. Oh my word, what's he done? Another mis-count. He had 50 left, and hit treble 20! He bust the score! He gets another chance, but misses bull. Lewis for 138... just missing double 12. Anderson two at D12. He goes 5-3 up, but in such bizarre circumstances. The pressure mounts on Lewis, but a 180 says he's not feeling it. Anderson, though, keeps the scoring high to keep pace with Jackpot. Lewis can't get a shot at 160, so Anderson comes for 161. Both men wobbly on the big checkouts, not helped by a bounce-out for Lewis. A really, really scrappy leg, characterised by Lewis missing double five. Anderson nips in and Lewis screams in anger. Seven the target, remember. Anderson, all tattoos on his right forearm, gets the eighth set under way. If he holds throw throughout, he'll be the big favourite. Lewis keeps pace with his 12th maximum, but it's Anderson on the dancefloor first. Six from 127 for Anderson, who leaves 40. Tree at tops... one needed. Simple hold. Is that the crucial moment of this final? Gary Anderson will return after the break to throw for a 5-3 lead. If I'm honest, it still seems a slightly poor quality final. We expected more than these averages of 99 (Lewis) and 98 (Anderson). Solid from Anderson, scoring that keeps Lewis at bay.That red bit in the 20 bed is kept busy as the players sing for the best of them all, Phil Taylor. Lewis gets loose, leaving Anderson with six from 130. He sets up 78 as a timely 140 gets Lewis to 36. One dart at top for Anderson...missed. Lewis at double 18... no. D9? No! Who wants this? Gary Anderson does! Double 10 gives him the seventh set against the darts. The champ leads 4-3 in a race to seven. Keith Dellor, a former world champ, is in Lewis' corner. The darts are warm now, there's 180s traded. Anderson for 104... bull? In the 25. Lewis must take 48, you feel. What is going on? Two too high. Anderson for D12...double six is the arrow. We have three breaks in as many legs, but Anderson is throwing for the set. They sing Anderson's name as he looks for the hold that consolidates the break. Is he just finding his best? A 180 says so, but Lewis is down to 81 first. Double 12? A break back. This is blow for blow stuff, a real slobberknocker. Can either of these players steal a march? Lewis has the darts in the seventh set. Time for a move? For the first time in the match, Anderson nudges his average ahead of Lewis, but both hover under 100. Two 14s for Anderson to break? Just wide. Lewis for tops? Too high. Anderson to break? D7 landed. Is this the surge? The 20 bed is starting to bear scars of being peppered. Big noise in the Palace as Anderson come for 170 and the set. One T20, but the second one missed. Lewis for 101 to keep in it. D12? Too high. Anderson gets one at the bull... bullseye! Anderson takes the set and levels it at 3-3. Anderson looking for the hold that will give him control of this sixth set, but Lewis, the man mountain, keeps on his tail. The crowd sing something about "boring tables" as Anderson comes for 60. Boring tables? Sounds like a day furniture shopping. Anderson's nose in front. He's one away from the set. Has Anderson got a reply? It's scrappy, but some sublime cover shooting at T19 gets Anderson down to 50 for a break. 10 for tops. Oooohhh, two missed, but he'll come back. Cleaned up. Break back. You can't get a Staffordshire oatcake between these two at the minute. Anderson is all in black, bar a smidge of tartan on his sleeve. It's like they ran out of material. He's throwing, but Lewis steals a march with successive 180s. The Palace alive as Lewis comes for 83. Double 16? A break of throw. Big, big leg for Lewis. The fifth set featured seven 180s, but it didn't feel that good. Anderson, the defending champ, has the darts in the sixth. These regular breaks are blessed relief for your humble live texter, who has sparks coming off his keyboard. The match is on throw, but that doesn't tell the story. Anderson could have been 3-1 up, but instead is 3-2 down. If one of these players can find their best, they can go a long way towards the Sid Waddell Trophy. Now we're cooking. Lewis opens with a 180 and follows that with a 140. He leaves 181 after six and is miles in front in his bid to win the fifth set. He leaves double 20 with Anderson miles back. Three darts in hand... three missed. Anderson back on 167, but gets no shot at double. Lewis for two fives. One missed, but the second landed. Lewis takes the fifth set. From 2-1 down, he leads 3-2. There's nothing wrong with the scoring - they trade 180s - but the double is awry. Lewis is even on the hunt for a nine-darter until he misses the sixth. He has a look at 85 for the set. Double 16? No. Double eight? No? Lewis has the habit of dropping his bottom lip every time he throws a dart. That 131 finish was jaw-dropping in itself. The quality creeps up a notch, now it's Anderson with a 180 to leave 41. Two darts at D20... both high. Unreal. Lewis for 76 to hold. One at D20...too low. Wobbly arrers. Oh Gary Anderson, chasing double round the board. Three missed. Now Lewis, a second landed at double 10. Odd on the doubles. The atmosphere in the Palace is reflecting the standard. There hasn't been much to cheer about yet. Anderson, though, fires a maximum to leave 96 after nine darts. No finish, but Lewis for 131... double 16? Yes! The best bit of tungsten we've seen so far. A break back. Remember that mis-count from Anderson in the fourth set? He could have been 3-1 up. Still, the Scot has started better here, three arrows on a pinhead in the T20 have him on 100 for a break. Two at tops... no! Lewis for two double 20s...one in, one out. Anderson cleans up D10 and breaks. If I'm honest, it's still not great. The players have been off for a brew. Lewis is throwing first in the fifth set. It's been a funny old game so far. Not the best quality, but compelling. Lewis is averaging 100 to Anderson's 95. Lewis is outscoring the champ, but Anderson is doubling better. Eng-ger-land is the song from the crowd, but it's Scotland that leads here. I say that, but Anderson loses focus. Can Lewis punish? A 140 says he can. Lewis to a finish first, he'll come for 77 for a break and the fourth set. One at double 20? Yes! What a remarkable leg. Anderson had it at his mercy, but one awful leg has let Lewis back in. Lewis wipes his face and exits the stage. Extraordinary. Lewis berates himself as he gets low of the treble 20. The fans sing about the Toure brothers - each to their own. Lewis, throwing first, just about keeps ahead and will come for 106. One dart at D16 just misses the checkout, but Lewis comes back and takes the green bit. That shouldn't cost Anderson too much, he still has the darts in this fourth set. The crowd sing Anderson's name once more as he puts the full force of his gold chain into peppering the cork. Six from 110, a set-up to leave double 18 as Lewis waits on 54. One for Anderson, who is the form horse right now. Can Lewis respond here? Since the first set, he's been a spectator. The big man looks ticked off, especially with Anderson again first to a finish despite Lewis having the darts. As the fans sing, Lewis must take out 115, but fails, leaving Anderson after two 12s. Awkward shot leaves one at double six. What? He's miscounted! Lewis is in for double eight! Unbelievable. Lewis was flustered there, so flustered he tried to throw first when it wasn't his honour. Lewis lands a maximum, the 626th of the tournament - a new record. Anderson for 121! Nailed with double 14! The champ is flying now. I wonder how big that might be in the context of this match. Just one break of throw is enough if you can hold for the rest of the night. Anderson throwing for a 2-1 lead, down to 170 as Lewis waits on 161. No shot at a double, but Lewis can't go out either. 75 for Anderson. Double six landed! Anderson wins the third set. Now then, this could be big. Lewis throwing first, but Anderson first to an out. 108. T17? Yes. 17? Yes. Tops? No! Just too low. Lewis for double 12? No! Another chance for Anderson, double 10 landed at the third attempt! Anderson breaks and will throw for the set. The Palace hasn't exploded yet. That might be because we haven't come to close to a player being pressured on his own throw. Anderson, the smaller man, leading here as the crowd try to sing his name. At least six darts from 105, with the first three a right pig's ear. Pressure on a 76 finish... again it's awful. Better from Lewis, who peppers the red bit to register his third maximum. He keeps Anderson at bay and will have six from 121 for the opening leg. Double 16 for the 121 checkout... just inside the wire. Tidied up with double eight. We're back. All square in the race to seven. Lewis has the arrers in hand. Another break. What do darts players do in these breaks? Comfort stop? Phone their mum? Check Twitter? Curious from Lewis, who looks to be a different man from the first set. Anderson, though, is living up to his Flying Scotsman nickname. He's on 41 for the set with Lewis miles back. Tops! An 11-darter and it's levels, you devils. Elgan Evan Alderman: My money's on Ben Stokes tonight. Anderson, by the way, averaged 132 in the first set of last night's semi-final win over Jelle Klaasen. Tonight that average was below 80. That's better from the Scot, a 180 keeping Lewis at arm's length. He'll come for 81 as Lewis waits on 82. Double 12, easy peasy. Better from Anderson. The players take a break after the first set, but are back on stage now for the second. Anderson has the arrers in hand. He had to chase around the board, but he eventually sealed it with double five. Lewis winning the first set is no great shakes - he did have the darts - but he won it by breaking Anderson's throw. The champion barely turned up for that opening salvo. Lewis is a huge man. If he tells you it's Christmas, you sing carols. He's getting into a better grooves, looking for 132 with two bulls. Missed the second. He's back for tops, landing one in the lipstick. We're on throw. They sing for Anderson as he throws first in the second leg. I'm surprised we haven't had a maximum yet. Oooohhh, that's ugly. Only 278 from Anderson, but Lewis doesn't take advantage. There's definite tension out there. Anderson looks for 119, but can't take it. Lewis 120 for a break. No. Anderson 79. One at tops... pulled low, but Lewis can't take out three chances at double 10. Eventually it's Anderson, but it's scrappy. Pranav Madabhushi: Lewis has to throw incredible doubles to beat Anderson. Anderson's doubles efficiency is nearly perfect. Liam Forsyth: The form and head to head says Anderson, and you can be sure he'll be out to avenge his loss in 2011. Game on! Solid start from Lewis, who makes the early running to leave Anderson trailing miles behind. The man from Stoke is first down to a finish. 121 with Anderson miles back. Double eight nailed at the first time of asking. Easy. They're singing for Anderson as the players throw some warm-up darts. The dancing girls depart, we're ready to go. Jonathan #JB17: Gary Anderson to win it 7-5 he'll take some beating after last night. "And now, the pride of Scotland. The reigning and defending champion of the woooooorrrlllllldddd, the Flying Scotsman, Gary Anderson!" Jump Around from House of Pain. "Jump, jump, jump, jump, jump!" The Palace is going bonkers. Lewis is kissing so many people he might never get on the stage. "Would you please welcome, from Stoke-on-Trent, the two-time champion of the world. It's Jackpot, Adrian Lewis! "Der, der, der, Ad-ri-an Lew-is." "Ladies and gentlemen, this is the moment we've all been waiting for." Our MC is on the mic. Here they come. Walk-ons with the sort razzmatazz you'd expect in the WWE. "Oh Gary, Gary. Gary, Gary, Gary, Gary And-er-son." They're singing in the Palace. "Stand up if you love the darts." We salute you, Emma. Hot chocolate and biscuits (and a onesie) sounds like the way to go this evening. If anyone else is following the darts in a onesie, do let me know. Emma Halford: Christmas onesie is on. I have biscuits. I have hot chocolate. Bring on the text coverage of the PDC final! Charlie Richardson: The last time these two met in the final Lewis hit a 9 darter; Anderson hit one last night and chances are we'll see one tonight. The atmosphere is building inside the Alexandra Palace. We're getting under way in just over five minutes. There's a chap in there holding a Japan flag. The darts is international. These guys' routes to the final couldn't have been easier...hard to see which way it will go. Who is likely to keep their head? 'Flying' Gary to win 7-4. Sorry Adrian. Either way, love the darts, lets have it. The Sid Waddell Trophy, named after the voice of darts. The great man died in 2012, with the World Championship introducing this trophy the year after. Fittingly Phil Taylor, the best of them all, got his hands on the prize first. They've thrown for the bull in the practice room. Lewis was straight in the centre and has won the throw. The early advantage? BDO world champion Scott Mitchell: "I've done exhibitions with Gary and Adrian over the past year and you couldn't meet nicer guys. I really do wish them both luck. "Gary I can feel for because he's going back as champion, as I have, but Adrian knows what it's about. He's the underdog and that may suit Adrian. "No matter what happens, it will be a good final and neither player will be frightened of one another." Defending BDO champion Scott Mitchell has battled through to the second round of the BDO World Championships, defeating Kiwi qualifier Craig Caldwell in a deciding set. The 45-year-old from the New Forest fought back from 1-0 and 2-1 down to reach the last 16 with a 3-2 victory. Caldwell hit nine 180s but Mitchell’s superior finishing proved decisive. You can watch highlights of today's play from 23:30-00:20 on BBC Two. Stuie Neale: Gary hit that 9 darter last night. I'm going 7-6 Gary in an 11th leg sudden death decider! In fact, don't just settle in - get involved. You can get in touch using the hashtag #bbcdarts by texting 81111 or posting on our Facebook page. Send your predictions, but also ponder a couple of things. Has any sport improved its standard over the past 10 years as much as darts? Also, what would your darts nickname be? If not yours, then which stars from others sports could strut their stuff on the oche? And what a party it is likely to be. Anderson, the defending champion, the man of nine-dart perfection just last night against Lewis, the two-time winner and a man who beat Anderson in the final five years ago. It should be a thriller and is likely to go long into the night. Grab a cold one and settle in. Yep, what better way to celebrate the end of the festive season than the final of the sporting event synonymous with Christmas? The PDC World Championship final - Gary Anderson versus Adrian Lewis. Come on, join in. We're having a party. Der der der der der, der der der der der, der der der der der. There is, though, one last thing to enjoy. There is enough time for one last big blowout. There is still one more party. Listen hard. Can you hear it? No more turkey sandwiches, no Slade, no back-to-back Only Fools and Horses. Back to work or school tomorrow. It will be the bluest of blue Mondays. It's pretty much over, isn't it? Christmas is set to leave us for another year. After all that build-up (I think I saw one Christmas tree in September), it went by in the blink of an eye. I know, I know. It really is a horrible Sunday night. There probably won't be a worse one for the rest of 2016.